Yesterday would have been my father's 70th Birthday. He is the one who gave me the gift of boating and I wish he could have been here to go out on the boat with me. I thought I'd share one of my favorite Dad/boating stories. Summer of 69. Headed out for the family vacation on a Friday afternoon. Lost a water pump in the truck not 20 miles from home. Changed it beside the road and headed up to the lake. Set up camp and launched the boat. As mom backed it off the trailer, threw a rod. My Dad packed up everthing and headed home. Boy was he pissed. Woke up Saturday morning and my Dad was already up, out front removing the 312 Ford Engine from my mother's station wagon. He outfitted it, installed it in the boat, and we went skiing Sunday. Bought my mom a new wagon on Monday. My Dad had a stroke when he was 55. For the last 13 years of his life he couldn't move his right arm, and could barely speak or walk. Yet, everytime he came to visit, the first thing he packed was a life jacket. I had to lift him in and out of the boat, but he didn't mind. He wanted to be in that boat. Boating is really about family and friends. It's a way of life that gets in your blood. Everytime I go out I'm grateful to my Dad for introducing me to this terrific pastime. You touched a nerve. My dad died a couple years ago. I spoke at his funeral and one of the memories I shared was when I was a kid waiting on the dock in the afternoon because we could see my Dad's car cross the bridge on his way home from work. And how many, many evenings he towed me behind the old wood Hiliner and then the 66 Mustang, one summer patiently teaching me how to go on one. They were memories that stuck with all three of us kids. My sister has lived on a lake and skied for the past 25 years, my brother bought a summer place on the same lake we were on as kids (the family camp had been sold). I have had a boat since I was 26 (that's 24 years) and have always lived near, but never on the water. Now I do have a "summer place" on the water with the primary objective of creating for my kids the same memories I have. My dad was my driver. He would pull me almost everyweekend from the time I was 18 - 30 every summer when we went to the lake. He put up with a lot of crap from me behind the boat. I was / am a very picky skier/barefooter. He died in 1992 @ 55 yrs. old in an airplane accident pulling my cousin from a plane that they went down in when it blew up. Got them both. I hardly ever skied a whole lot since. Now my son is 15 and can drive a boat. He was doing quite well behind the wheel of my dad's '81 Cobalt. He got to pull me in the new to me SN and he STOKED. He is not much of a skier but now with the Nautique he is pumped about wake boarding a little more. He really likes driving this boat. Hope to get it in the water tonight if it is running 100%~! I tuned it up and something was not right. Glad to have a boat mechanic as a good friend live close buy to help. Everyone else enjoy your dads and tell them how great they are for taking you skiing~! Wish I had more ofter~! I shared a similar story at my Dad's funeral. Ours was a Wooden, 58 Trojan. I used to wait on the front lawn, vest on and ski in hand. Many nights when I know he was awfully tired, but he always took me out anyway. Powerful stuff that comes out of this "little boaters" website. Awesome that you guys share your memories. My dad died 14 years ago also a very young 58. He used to get up at 3:30am on a saturday and load up the truck and boat and have everything ready before waking anyone else. We would be the first ones in line at the lake waiting for the ranger to open the gate at 6am. He did all that because he knew it was the only way his boys would get a couple ski runs on glass. He loved to drive, watch and cheer us on. We had an old Thunderbird trihull w/ a Johnson 135 hp outboard he installed a center pull pylon so we could pretend we had a "real" ski boat. 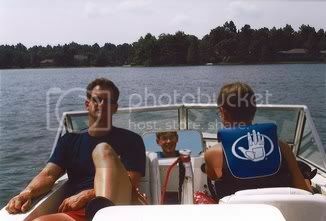 Happy Bday to your dad BKH, im sure he continues to enjoy watching his family enjoy boating. I remember the old boat my Dad bought when I was teen. I had learned with my uncle John on Lake Huntsville when I about 10, and as a teen my dad bought an old 15''glas boat with a 35 Evinrude. We actually skied slalom with that old rig. The old man is still going strong at 84 and says he could ski, if he wanted to. All of us who still have dads around should remember to tell him how glad we are they took the time with us. For those of us who still are lucky enough spend time on the lake with dad...we read your stories and realize that time will some day be gone...for now , make that time available as often as you can...like he did for us ! My father is in his 70's and his passion for boating is still a way of life...he spends about every other month boating in Florida.When he is here , we meet on the lake...his large house boat is where we swim ,eat ,pour beverage and try to keep track of the youngsters! We bring our boat to take the kids skiing...he loves to watch his grandsons ride thier boards.Sometimes he suggests that he could surely get up a make a run!!! I wish I could give him just one good last pull...he knows that the next day would be hell though...damn, I do admire the that kind of spirit! I lost my dad 4 years ago. He was a workaholic and while he really loved boats, he unfortunately spent more time with his nose in the boat magazines than he did on the boat. But he certainly managed to make damn sure that there was always a family boat available for me. I realized years later that he really derived so much of his satisfaction and a great deal of pleasure just seeing and knowing the fun I was having that he was affording me. Once, a local marine patrol officer he knew informed him that he never saw any boat on the river more than he did mine, and that it must have a million hours on it. My dad repeated that story 1000 times. He taught me to ski behind, and get this, a 16' fiberglass 1957 Thunderbird (so the registration said), with TWIN 40 HP Evinrudes. It must have been the first 'glass boat made and was this huge, tall, wide, bulbous thing, but it worked. A number of years later he supported me on my first Correct Craft project, the restoration of a 1958 Starflite (fins and all) when I was in college. I miss my dad and all that he did for me, and most of which I was somewhat oblivious to. My wife and I never had kids, but just yesterday afternoon I was fortunate enough to be able to take a dozen+ Boy Scouts, screaming like Girl Scouts, tubing behind a CC Mustang. Thanks Dad. One other thing to think about as you read this thread....Now we are the dads. Makes it all kind of worthwhile, doesn't it? OK, I had to reply to this. My dad made our first ski boat, about 14', powered by a 60 horse "Gale" engine, sometime around 1958, I was 2. But, I learned to ski behind an aluminum fishing boat with a 9.5 Johnson. Dad, in his 80's now, still has the cabin at the Lake of the Ozarks that he and his dad built (the boat needed a home). It's still my favorite place in the world, although now extremely busy. The second boat dad got was a 16' 1970 Chrysler trihull, powered by an 85 horse Johnson. The boat is still running strong, and talk about a small wake for skiing. Each of my three boys learned to ski behind this boat. Time with my dad and grandfather at "The Lake" are priceless stored memories, working on docks, boats, and adding on to the cabin. I can't think of a better way to grow up. Father's day. I thought I would revive this thread. I remember the late sixties. We used to have a 3ft wide plywood "saucer" painted with sand thrown in so you wouldn't slip. My dad used to travel back and forth on the water behind the house doing all kinds of crazy things. He'd put a bar stool on the disk and stand on top. Everyone in the neighborhood thought he was nuts. I thought it was about the coolest thing I'd ever seen. Still have the pictures of my dad's 58 Trojan inboard hanging on the wall in my office. I thought about this thread today! Glad you pulled it up! Wifes dad and mine are both comming over today! Both are boaters! Brian...happy first Father's day to you! Thanks Brian for pulling this thread back up, alto it is hard to read with tears streaming down my face. My Dad taught us to ski behind an old "twin" engine outboard. Boy did we think that was cool. Boat belonged to a friend of his, he could never afford one. So he loved me and my brother's Nautiques. Never had to worry where my son was or what he wanted to do for the weekends. He always had the motorhome loaded and the boat hooked up every Friday the entire time he grew up. Great way to share with your kids. Skiing and Correct Crafts! Thanks again Brian. What a GREAT site!. Hope you had a happy father's day!. Your first of many more you'll enjoy! My dad was never a skier and my family was never really into watersports, but I spent quite a few hours on the boat with dad fishing. Even though we didn't really ski, he knew about inboards and especially Ski Nautiques. As we trolled by boats on lifts and docks while fishing for hours and hours, he would always point out the inboards to me and tell me how cool they were and why they were cool. I have hundreds of hours of fishing memories with dad that I will always remember, and without his constant pointing out of inboards, I can gaurantee I would not be as in to them as I am today, and probably would never own one. He gave me 1000.00 towards my first Nautique and drove his own car 3200 miles to pick it up in AZ. He even came with my wife and I to pick up and test drive our current 2000 SN. We're certainly happy that he's still with us, hopefully for many years to come. Funny you brought this thread back up to the top. I was thinking of doing the same thing. Didn't get to the lake yesterday, but did spend the day at the beach with my family and then a good amount of time playing catch with my son in the back yard and then a family game of touch football, plus a few thoughts about "the old man". Good times and good memories, old and new. My story is along the lines of M3Fan. We vacationed on lakes for many years and finally bought a '78 pontoon boat all original about 12 years ago. As we pulled it out of the sellers lawn cats fled from under the cover. All the kids learned to ski behind this boat on the Snoopy trainers. The old 50 hp Merc wasn't cutting it for much other than combo skiing, so he went ahead and spent 3X the cost of the boat on a new 70 hp engine. I was always drawn to inboards (especially the old loud Ski Nautiques) although we never had one or knew anyone with one. Dad bought some PWCs and those were cool for a few years but eventually sold them during the divorce and he gave us kids the money to put toward our current '88 SN. I still don't think he's even seen the boat in the 5 years we've had it but maybe this year we'll get him out on it. Well, it's nice to hear another member that didn't have inboards all his life. Seems like almost everyone grew up with them all over. We drooled at inboards for years, but there was no way my family would have had the money to even think about getting one for one second. We had the crappiest boat of ALL TIME, which only ran for a few years before becoming basically a fixture in our driveway and for years. My test drive for my first boat was the first time in my adult life I EVER skied behind or drove an inboard! My test drive for my first boat was the first time in my adult life I EVER skied behind or drove an inboard! Me too. I didn't even drive it, the PO did as well as my brother. When asked if I wanted to drive I replied "I'll drive it when it's mine". This has morphed into a little different conversation but my first boat with my dad was a 10' aluminum john boat with a 3hp Johnson. We tooled around everypond in Rhode Island and fished just about every night after dad got home from work. Very fond memories and although Dad lives 1100 miles away now he is retired and still fishes every day. As for my first inboard, I owned a 16' starcraft with a 90hp mercury and got an invite to go skiing with a friend. We showed and the boat we were to ski behind was a 82 Stars & Stripes MC and was for sale. We skiied the course, I took my first trip over a ski jump. I bought the boat the very next day. The rest is history and I'll never own anything but an inboard again. My poor fair skinned father sat in our hand me down 14ft mfg with 1967 40hp evinrude (no electric start) and pulled and pulled and pulled us 5 kids every afternoon and all weekend, until of course something inevitably broke (typically when we talked my mother into driving it when dad was at work). Then it would be hours of struggling with cross threaded flywheel nuts or lower units with two water lines, a shifting linkage, and a drive shaft that all had to be aligned at once. He melted in the sun wearing a hat long sleeve shirt and pants, that motor frustrated the hell out of him, but that boat got more use than the next two most active boats on the lake combined. I had almost as much fun watching him fix it as riding behind it and picked up enough to be able to take over motor duty by the time I was 14 or so. My dad finally retired this year, he now has a 14 foot aluminum boat with a early 60's 40hp Johnson. I bought him an electric start for it on ebay last christmas and he no longer works on it. maybe now he will do some of that fishing that he never got around to doing when we were kids and more interested in skiing. Although he has already mentioned teaching the grandkids to ski behind his outboard since it has a smaller a wake. Anyway I also just recently aquired my first inboard, I won't say I will never have anything else, but I will always have at least one inboard. Just thought I'd revive this thread once again. Today would have been my Dad's 72nd birthday. He's been gone almost three years now. Today I drove almost 400 miles with my wife and daughter to check out a lake I might vacation at next summer with the family. I think my Dad would have enjoyed the ride. Somehow I know he was there with us. To those of you who still have your fathers - be good to them. Maybe go out of your way to get Dad out on the boat before summer is over. He won't be with you forever. Good stuff, thanks for bringing this back. My Dad is definitely slowing down now, but we did get a boat ride in together at the first of the summer. You are so right, treasuring family is an investment that will always bring returns. BKH: Thanks for bringing this back up to make us all pause and think of our dads. Cool of you to honor your Dad's memory this way. BKH Thanks for that suggestion, My dad is retired now and was a musician and a mechanic. This fathersday that just passed my brother and I took him to go see a live band (tower of power) at the casino and he hasn't stoped talkin about it yet. He keeps hearing me and the 2boys talk about the fun we have everyweekend, and how great these old CC's are. He's asked a few times about how that moter runs and pulls out the hole. So today im puttin the top on and the 540 back on and going pick him up to go for a sunday cruise. Im thinking he will talk about that for a while too. I just re-read this thread and it's killin' me. Just the thought of being in Brian's situation puts a big lump in my throat. My Grandfather (Quintin Quincy Quinn) worked for and purchased a lake lot from CL&P (Connecticut Light & Power) on Lake Candlewood back in the late 40's or early 50's. Grandpa, my Dad and his brothers built a small cabin on that lot as well as a boat house down by the water. Dad's first job out of school brought him from Ct. to Chicago where I was born and raised. Growing up each summer pop's would load us all in the Country Squire wagon for the trip out East, the first week he would vacation with us then back to work for 3 weeks then the last week with us before loading up the wagon for the return trip. The summers out east are my greatest childhood memories, whenever I get back to the Lake the smell brings all those memories back. When Grandpa passed my Dad ended up with the cabin, I could never imagine that Lake house belonging to anyone else but a Quinn. The stories of my summers are endless but my favorite thing was always the skiing, of my 2 bro's and 1 sis I was the one who caught the bug the hardest, Dad taught me to ski at 5 behind our Yellow Rinken Tri-Hull with a 70hp Chrysler OB and my passion just grew from there. Next door was my Dad's buddy Bill Murray, the real life version of Popeye, WWII vet who served in the Navy and fought in Japan, together they spent endless hours teaching and pulling kid's skiing, we even created our own ski shows. Never a Nautique in the mix however when I was looking for my first boat a competition inboard was the only choice. Bought my 77' and could not wait to drag it back east for everyone to see, since that boat 4 of my CC's have made the trek to Candlewood. My folks now spend all their summers at the Lake, Bill is still next door, Candlewood has been and always will be my favorite Lake destination. For all those great skiing and boating memories then, now and to come, Thanks Dad!! Great stories guys, makes me thankful for the father I still have. eric, great job on spending time with your kids. There is no such thing as QUALITY time, only QUANTITY. My goal each day is to be a better Father than I was the day before, and with God's help I have done pretty well. I'm sure you are too. Root, did you get your Dad out on the boat?